What is the best recipe for everyday dinner? Something tasty, quick and easy to prepare and at the same time healthy! A delicious recipe, a quick dinner, something practical but also delicious and possibly healthy and tasty. Well, today our Amica Natura, Elisabetta Pend of the food blog I feel Betta has simply interpreted a second classic dish of Italian cuisine, the veal cutlet alla Milanese, historical and traditional preparation of Amica Natura, made with light ingredients and raw materials of quality. The Amica Natura cutlet is made with an excellent cut of veal, breaded with a few genuine ingredients that allow a quick and fragrant cooking even in the oven. 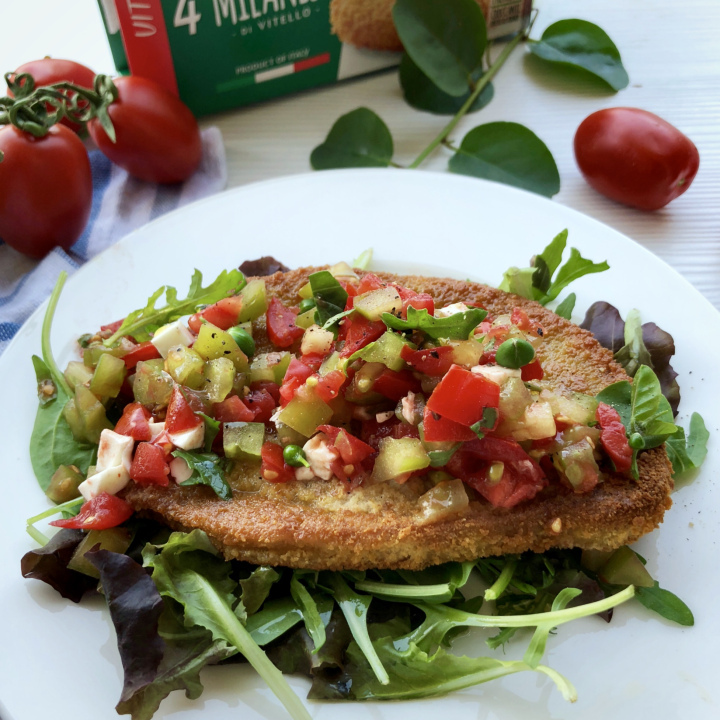 The Amica Natura Milanese cutlet does not contain preservatives or additives and the deep-freezing process allows it to be kept at its maximum freshness and nutritional quality. So let’s see how to prepare in a few minutes a delicious dinner for the whole family, even when you are tired during the week after work and a thousand commitments. The Amica Natura Italian frozen cutlets unlike many other brands, since it is a high quality brand, are not pre-fried and contain no preservatives. Prepare a mixed mixture with the red and green tomatoes, let the water dripping for a few minutes, place them in a bowl and add the washed rocket, salt, pepper and basil leaves broken with your hands. Cut the primosale into cubes of the same size as the tomatoes, remove the fresh caper fruits from the leaves, wash them, and add them together with the cheese in the bowl, stir, and season with 1 tablespoon of oil. Keep aside while cooking the milanesine. Heat the oven and cook the cutlet as shown on the package, turning them once until they are golden brown. Salt them lightly. Place a Milanese on each plate and cover it with the previously prepared salad. with its dressing, which creates a delicious contrast between the still warm crunchy breading, with the freshness of raw tomatoes.